It's pretty weird entering into this new world. It's something I probably would have done years ago (in fact - the original plan had me having two kids by now - but that didn't happen, although she now has a daughter of her own). Once Nai and I had decided that we were going to do it (when we worked out when we could start trying - based upon when her maternity leave kicked in), I was pretty much committed. Jogging around Albert Park Lake one day, with my best mate Brendan, I asked him if he'd like to mind the house while we went away - as we were planning a trip, and then planning to try for a kid. He was pretty blown away - but really happy - and that's mainly for the kid bit. That sorta surprised me somewhat. I mean... we are really good mates and spend a lot of time together. We've seen a lot of bands, and we motivate each other to exercise - this Summer's TriAthlon Slab Challenge is off to a hot start. But this would really change our relationship. I'm sure he knew this, as he's got a few good friends with kids. Anyway, when we came back from the holiday, he was one of the first people we told (it was pretty hard not to, as he was minding the house - but he would've found out pretty quickly anyway). And he's ecstatic. Some of my oldest friends Matt (who has two), Cam (who has one, and now another on the way) were similarly pretty chuffed. Another friend, Chris, who has little Ben, was REALLY blown away. And finally, Dean, who I SMSed the first scanned image to with the caption 'guess what?' could not contain his excitement. It was quite amazing. I dunno - perhaps it's just me who's a bit blaze about other people's kids...? I know I couldn't get enough of my nephew when he was born, but that was 22 yrs ago. But to Dean and Chris and Matt and Cam all my other mates - and in particular to Brendan, they can see the joy in my eyes and the excitement that's building. They also know me well enough to realise that it's just another excuse for me to buy gadgets and toys. YAY! Oh... and the tasche? 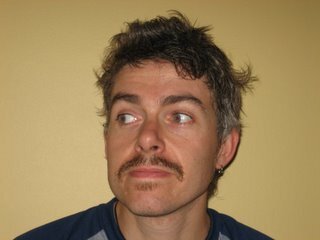 It was for MOvember, to raise money for prostate cancer research. It went 5 mins after the picture was taken! Yes, I watched Cory put his Star Wars toys... err I mean collectables... away the other week - in preparation for BB. Nai - you are going to have to sit Cory down as it looks like BB is not going to be allowed to share Cory's toys, but I am pretty sure Cory will be sharing BB's. That moustache... you look so familiar... do you clean pools? !